This activity was originally submitted as part of the Wangaratta District Showcase. (formerly Goulburn North-Eastern Region) of Victoria. This mathematical investigation of Ayers Rock was given to Year 7 during a unit of work on measurement. 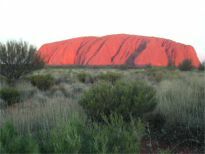 This investigation challenges students to calculate the area and perimeter of Ayers Rock. From the provided map students use the scale grid to construct a square grid pattern over the base profile of the rock to calculate the area of the base of the rock. To find the perimeter students use the scale grid to estimate the perimeter of the base of Ayers Rock. Provides reinforcement of the concept of area and perimeter. Provides a relevant Australia interest factor to develop measurement concepts.